Who Loses When Libraries Close? First, a note on how we did this research: our iMapLibraries project (http://www.imaplibraries.org) seeks to build a planning tool for local library data and to integrate this with U.S. Census data. We used gravity modeling to estimate a geographic market area for every library in the U.S. The gravity modeling method assigns everyone to their geographically nearest library. We had to choose a way to estimate this ourselves, since library systems sometimes do not estimate geographic market areas for each local branch library due to policies that “all are served” who walk through the door – a card for any library will let you check out items from any of the other libraries in the system countywide or citywide. Yet, to better understand what is happening at the local library branch level — such as the local impact of 22 neighborhood libraries closing in Miami Dade — you must start with at least some basic estimate of who each library serves, and where those people live. Some researchers use different methods such as drawing a circle at a one-mile or two mile radius around each local library. The data we present below for the Miami Dade libraries were checked and confirmed by all three of the market area estimation methods we used – the gravity model, one-mile radius, and two mile radius. However, all of these methods are still imperfect – the very best geographic market area estimate would ideally come from each library’s staff and the local planning office, and the very best demographic data would be up to the minute data (we used 2005-2010 U.S. Census Bureau data and 2010 Census data). Here is more info about our data and the limitations of our method. As we saw last week, libraries provide more than just books. For families with children, libraries offer an alternative to the streets as a safe space in the local community for kids and teens to play, read, and participate in learning activities; when school ends, libraries run “summer reading programs” to help children maintain their reading skills gains into the next school year. We often hear the lament that “Johnny can’t read” — yet libraries are where many kids learn to enjoy reading. Among the 22 Miami Dade communities at risk of closing libraries, eight in particular have more than 40% of households as families with children: Doral, Country Walk, West Kendall, Hialeah Gardens, Lakes of the Meadow, Golden Glades, Opa-Locka, and Model City. When libraries are nearby, kids can walk from home or school. In some cases, parents may not have the library and reading habit, and kids or teens who walk to the library from their homes or schools may end up teaching their parents about local libraries. But as distance increases, parents must spend time and money on transportation to take kids to the library — perhaps purchasing gas or paying transit fees, and trying to find time after work or between jobs. Longer travel distances over public transit could also be a barrier to library use since items often must be carried in both directions — books/videos to be returned, and new books/videos to be brought home. Parents using public transit could also be carrying or managing children at the same time. Among renters living in the 22 communities, at least 14% or more did not own a car for the library market areas of South Shore, Model City, Civic Center, Culmer/Overtown, Little River and Lemon City. Renters also sometimes don’t have time to develop relationships with neighborhood institutions such as their local library, particularly a farther away “next nearest” library. Many seniors living on fixed incomes rely on nearby libraries for free computer access and technology training, as well as newspapers and other special resources such as large print books, audiobooks and assistive devices for those with disabilities. Libraries often are part of the socialization and recreational routines for many seniors. Seniors may also particularly suffer in losing a local neighborhood library due to mobility impairments and difficulties with driving or using public transit to reach a more distant location. The communities slated to lose libraries which had higher numbers of Social Security recipients (seniors & disabled)– more than 30% — were Fairlawn, Concord, and Opa-Locka. Many of the other libraries had at least 20% (one-fifth or more) in their market area populations who were receiving Social Security, which suggests that if their local libraries close, it’s possible these areas could see increased demand for outreach services to seniors and disabled such as home delivery services or bookmobiles, as well as increased demands for large print materials, audiobooks, and assistive devices at “next-nearest” libraries. In addition to those other three libraries, the libraries with at least 20% or more of their local market area populations receiving Social Security were Model City, Sunset, Little River, Civic Center, Lakes of the Meadow, North Shore, Golden Glades, Virrick Park, Hialeah Gardens, California Club, Tamiami and Lemon City. We noted last week how libraries reflect the communities they serve by offering special collections and services, such as African American art and book collections and Spanish language materials and workshops. Miami-Dade is diverse, vibrant and multi-cultural, and among the libraries on the list to be closed are libraries with “majority minority” populations – that is, over 50% Blacks or Hispanics. 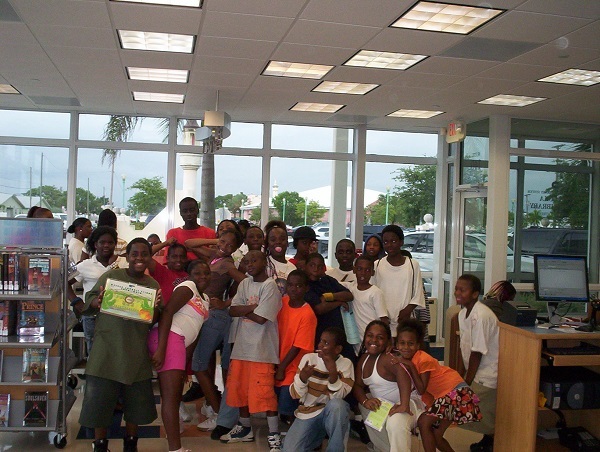 The libraries with over 50% Black populations in their local market areas were Golden Glades, Model City, Opa-Locka and Little River. The libraries in market areas with over 50% Hispanic populations were Hialeah Gardens, Concord, Fairlawn, Lakes of the Meadow, Shenandoah, Civic Center, Sunset, Doral, West Kendall, Country Walk, Tamiami, Virrick Park, North Shore and Culmer/Overtown. Closing these library branches would thus bring some issues of whether special collections and services that reflect these local communities would now be made available at next-nearest libraries, such as bilingual services and workshops in Spanish, or the museum quality African textiles and sculptures at Model City, or Culmer/Overtown’s special children’s and Black culture collections. Above all, the public library is the “people’s university” where people can apply themselves to education and learning, with free access to resources they need to ‘pull themselves up by their bootstraps.’ People use the books, journals, databases and computers at the local library to research and work on writing small business plans, search for jobs and write resumes. In their local public libraries, people who don’t have a high school diploma and can’t afford expensive “test prep” classes can still borrow materials for free to study for high school equivalency exams (GEDs), vocational exams and certifications. Communities slated to lose their local libraries which also had the lowest numbers of college-educated populations – 20% or lower were Model City, Civic Center, Opa-Locka, Hialeah Gardens, Golden Glades and Little River. Communities with 29% or more of market area populations having no high school degree were Civic Center, Model City, Opa-Locka, Little River and Culmer-Overtown. If the 22 Miami Dade libraries are closed, one of the greatest risks would be of those communities becoming isolated from library services and losing habits of regular participation in literacy and reading activities. Maintaining a reading habit is difficult without continuing access to new materials to read. Researchers have found that library use decreases as distance from the library increases (Jue, Koontz et al, 1999) and that ethnic minority groups, low income groups, children, and the elderly often cannot or will not travel far outside of their own neighborhood areas for library use (Hayes & Palmer, 1983; Obokoh & Arokoyu, 1991; Van House, 1983). For low income households, distance is more of a barrier than for wealthy households (Van House, 1983). If the “next nearest” library is too far away, there is the risk that many people in these communities, especially poor people, elderly, children and ethnic minority groups, will simply no longer access libraries. In a future post, we’ll take a closer look at equity issues in library access, and how closures impact the balance for access among all communities. In the meantime, check out our iMapLibraries site http://imaplibraries.org/ where we have posted our Miami Dade branch level library reports; you can also use our prototype tool to check out library branch level market area data in other local communities nationwide. Jue, D.K., Koontz, C. M., Magpantay, J. A., Lance, K. C., Seidl, A.M. (1999). Using public libraries to provide technology access for individuals in poverty: A nationwide analysis of library market areas using a geographic information system Library & Information Science Research, 21( 3): 299–325. Hayes, R., & Palmer, E.S. (1983). The effects of distance upon use of libraries: Case studies based on a survey of users of the Los Angeles Public Library Central Library and branches.” Library Research 5: 67 – 100. Obokoh, N.P. & Arokoyu, S.B. (1991). The influence of geographical location on public library use: A case study from a developing country. SLA Geography and Map Division, 163: 30-42. Van House, N. A. (1983). Public library user fees: The use and finance of public libraries. Westport, Conn.: Greenwood Press. So much goes into developing a library, its collections and people including its customers and the information and wonder they gain–Libraries can not then close quickly. There is too much at stake and too much to be lost that is incalculable–no other agency serves this role. A closed library has no duplication of services to fill the gap..
And what message is being sent to the kids in those minority-majority neighborhoods when their libraries are the ones being closed? How can they avoid feeling like the greater community has just “given up” on them. Absolutely great – the facts tell it all. Can Planning Data Save Libraries? Join us in a Virtual Forum! Are Library Closures Fair to Everyone? How Do You Choose Which Libraries to Close?